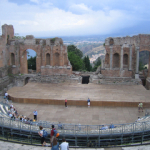 Taormina sits across the Strait of Messina, that divides the Region of Calabria from the Island of Sicily. Mother Nature has created a masterpiece here, painting the gorgeous sea into its background. Nature also one of this area’s biggest highlights, extraordinary under a limpid sky and sitting above marine depths where another world waits to be explored. So much like a kaleidoscope of hues, the sea changes from nocturnal blue to crystalline defined by slight blue veins. One of the marvels of this sea? 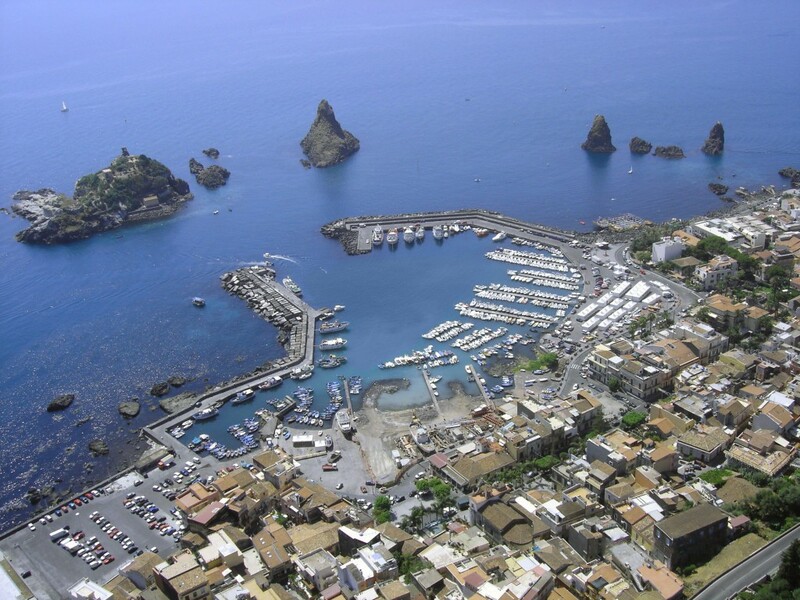 The Aeolian Islands: Lipari, Panarea, Salina, Stromboli, Vulcano, Filicudi and Alicudi are the seven pearls scattered over the waters facing Messina. All of volcanic origin, each contains its individual beauty and historical identity; together, they have been proclaimed a World Heritage Site. 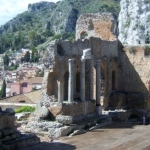 As in the past, Taormina is the main portal to Sicily. Greeks, Romans, Byzantines, Arabs, Normans and Swabians landed on its coasts and had a heavy influence on culture here and throughout the Island. 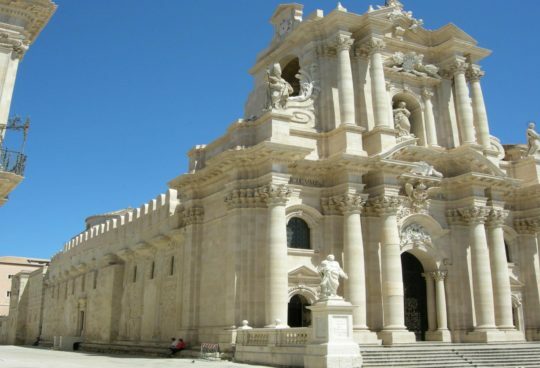 By exploring the small provincial town, one can discover precious works of art in its churches and palaces, and important traces of great and faraway civilizations. Above all, Taormina, dramatically perched on a precipice (and with a great view of Etna in one direction), is a sheer drop to the sea. Very steep and rocky, its coast is full of small bays colored by a lush maquis and all the blues of the sea. 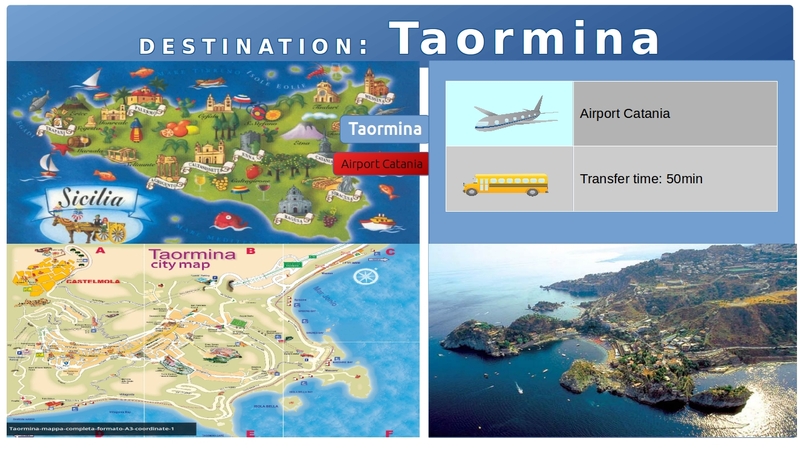 Taormina is considered the “Lady” of the Ionic Coast, port of destination for celebrities and illustrious personages. 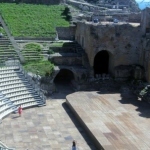 The Ancient Theatre, one of the greatest of the Greek-Roman epoch, is immersed in an expanse of olives, oranges and almond groves that fill the air with their exotic perfumes. Behind the theatrical stage, the scene opens up to the moon and stars that capture one’s gaze as reflect their light over the dark sea. Tiny art gems can be found in the alleys of its ancient quarter. 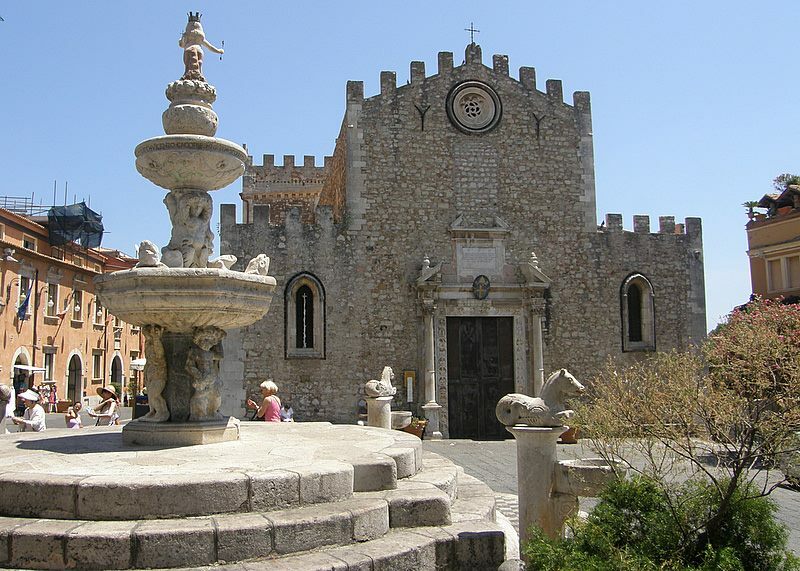 The Piazza Duomo, embellished by the Fountain of Montorsoli, highlights an ancient Cathedral, the exterior design of which recalls the lines of a fortress, graced by a splendid 17th-century portal. Behind the Church of Santa Caterina, we find the Odeon, a another (tiny) theatre from the Roman era, now used for cultural events. The active volcano Mt. 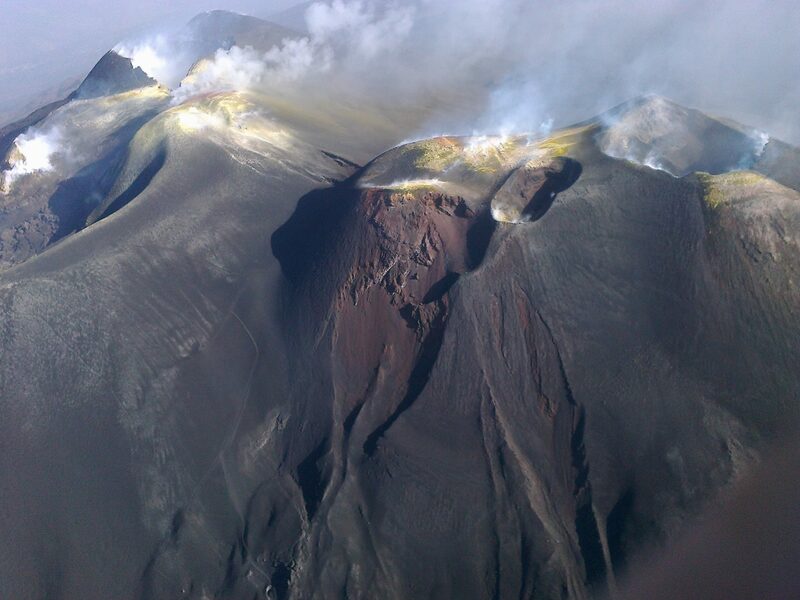 Etna, dominates over the landscape and reveals a vegetation interrupted by trails of black, solidified lava flows. Caves and different environments alternate along its slopes; traverse them in order to reach the peak, where a great “mouth of fire” awaits. The Aeolian Isles, above Messina’s northern coast, are an obligatory stopover for those in the area. A sequence of colors meets the eye, that is a mosaic of tiles of the most varied hues, with shades of the sea framing it all around. And as if to confirm Mother Nature’s own artistic gifts, it is well-known that the Aeolians were crafted by the volcanoes that, though destructive on one hand, have created masterpieces of incomparable beauty on the other. Panarea is the heart of local nightlife, whereas Stromboli is the height of natural force, with its incandescent flames that compete with the moon’s brightness to illuminate the night. 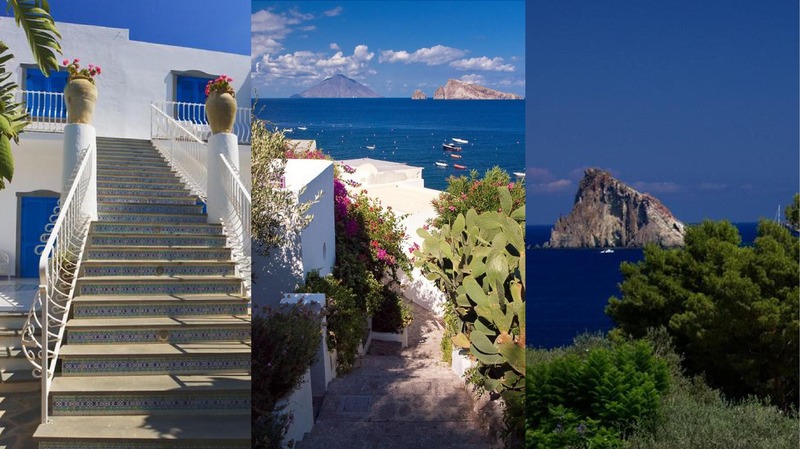 Vulcano is the archipelago’s black pearl, while Lipari is referred to as the “lighthouse” for the light irradiating from its mountain. 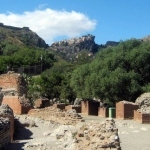 Salina, then, is the land of flavors and fragrances, whereas Filicudi and Alicudi are the most solitary and the most wild. 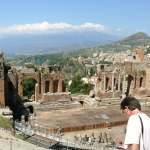 Excursions over land and sea allow for the discovery of every corner and angle Mount Etna and of the Aeolian Islands, rich in beaches and tiny coves where one can stop to explore, even if just for a few hours. Etna dominates the landscape and is ever-present in the inhabitants’ lives here, even so far as to shape the tastes of the land. 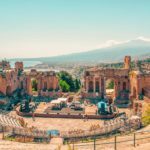 This active volcano and Catania itself – a bustling marvel of a city on Sicily’s eastern coast – are closely linked. Etna, one of the biggest active volcanoes in Europe, lies just north of Catania. This mountain lives, breathes and transforms itself and each time it awakes, red fiery flowing lava is deposited in its craters and, at the same time, overlaps with ancient flows, changing the mountain’s profile each time. The landscape changes greatly as one ascends higher. Pinewoods are divided into sections by fascinating fuming black lava and gaping craters. Fruit orchards, orange and lemon groves, oaks and majestic chestnut trees, luxuriant vineyards and expanses of beech trees also thrive from the volcano’s fertile soil. All contribute to the mountain’s diverse and incomparably-beautiful ambiences. Nothing survives up at the peak, only the lavic desert, a widespread blackness surrounding the volcano’s intriguing open mouth. Trekking and horseback riding itineraries are ideal for discovering the trails that spread out over the slopes of Etna, through the thick vegetation where many species of animals live. It is also the perfect place to engage in birdwatching. If you wish to put on your skis, come in the winter when Etna is covered with snow. You will not believe what you see. The skiing facilities ensure a sportive, enjoyable “white” holiday. Skiing with your gaze on the blueness of the sea below is an experience that only this area of Sicily can offer! This panorama that goes from mountains to sea changes before one’s very eyes. Do not miss the Riviera dei Ciclopi, a slew of enormous, mythology-bound boulders emerging from the sea. Aeolian Islands: one definite must is Pollara Beach on the island of Salina; Pollara was the result of a crater formed by the six volcanoes making up Salina, around 13,000 years ago. Here, one can take a hot bath of mud and saltwater that forms from the fumaroles (lava and gas emissions) of nearby Vulcano Island. Those arriving with a boat can circumnavigate the coasts and enjoy the spectacular natural hollows and giant boulders, rocks and mounds that surround the islands’ shores. The Aeolian Archipelago is a true paradise for trekkers. Hiking trails go on forever here, and take hikers on a journey of landscapes, putting the islands’ diverse beauty on full display. Lava deposits are a work of art in themselves, having been shaped by flowing seawater to create a splendid show of Mother Nature’s talent for special effects. Indescribable colors and suffused rays of light become an intense chiaroscuro that combines with the rich island vegetation and the shadows of the deep sea floor. Colors that range from white to stone and black pumice put in play a seemingly-infinite merry-go-round of marvels and delights. In a moment when you might think you have seen all that the islands have to offer, an ancient relict or an anomaly of nature just might surprise you, rendering your journey ever more fascinating. After all, the Aeolians are considered one of the best places in the world for scuba-diving! Birdwatchers, too, will find that the Aeolians are a dream destination for their interests. During the hottest months, pelicans, red herons, grey parrots, wild geese, cormorants, flamingoes and quails make their transits in the skies above. This is also an ideal locality to watch for diverse species of falcon, such as the Mediterranean falcon and the cuckoo. Another excellent site for spotting rare, winged creatures is the Regional Park of Nebrodi; in Italian, this park is known as the “lungs” of Sicily, so-called because of its vegetation and monumentally-high trees. 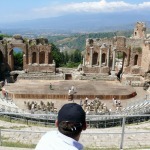 This is where Sicily breathes! 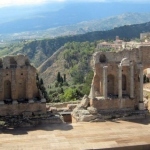 In spring, the park’s numerous peaks, cliffs and valleys bloom in the colors and scents of the Mediterranean, and numerous small, very-blue lakes alternate with bounteous woods. 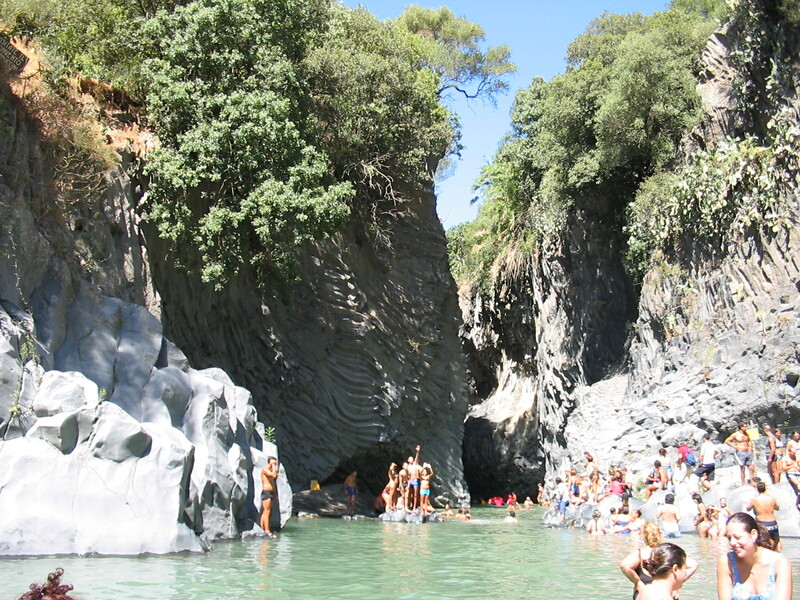 Those looking for an even cooler gulp of water can head to the Gole di Alcantara, made up of gorges and ravines that run with the cold waters from the river of the same name. 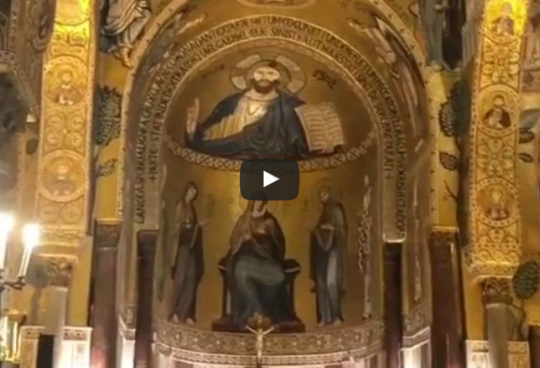 Nature has much to offer in Sicily, as do its people, who have preserved their very unique artistic and artisan traditions over the centuries. 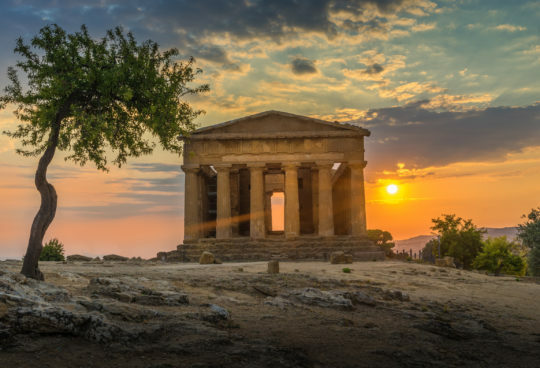 Handmade lace, reed and bulrush baskets, stone and cast-iron objects, colorful mats and carpets made with antique looms, and valuable ceramics are all for the taking, and are great ways to bring a part of Sicily back home with after your trip has ended.